What came first Les Misérables or musical theatre? After more than 25 years in London’s West End you’d be forgiven for thinking it was what is now the world's longest running musical. 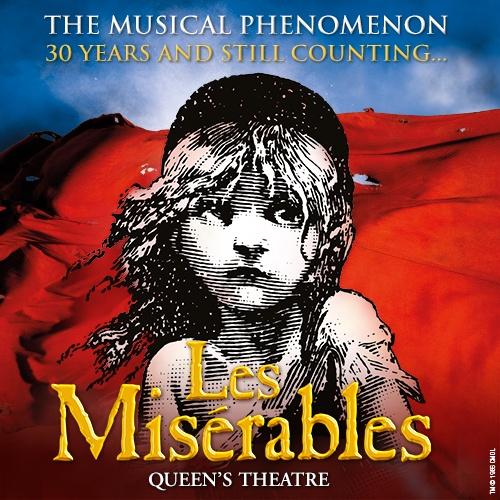 Based on the novel by Victor Hugo, Les Misérables has captivated more than 60 million people worldwide in 43 countries and in 21 languages since it originally opened in London at the Barbican Theatre on October 8th 1985. And after taking up its residence at the Queen’s Theatre, Cameron Mackintosh’s production is still very much a crowd pleaser. Originally based on Victor Hugo’s 1862 French novel of the same name, Les Misérables (or the ‘The Miserable Ones’) follows the rise of the French Empire after the Revolution – and the lives of the impoverished characters as they struggle for survival. With a 101-strong cast and crew and no less than 392 costumes and 31 wigs, you can expect to see all levels of society represented here, from prostitutes, criminals to politically-minded students, in this story of revolution, lovers and street gangs. Injecting a new lease of life in to the show, Mackintosh has also enlisted Matt Kinley to develop the production’s visual presentation, drawing inspiration from Victor Hugo’s own paintings. Complementing this spectacular set is also a full orchestra of around 22 players and an iconic score including the classic hits ‘I Dreamed a Dream’, ‘On My Own’, ‘Bring Him Home’ and ‘One Day More’. Which are no doubt just some of the many reasons behind its 70 major theatre awards, from Oliviers and Grammys to several Tony Awards including Best Musical and Best Score.